With the release of iPhone OS 3.0, Apple addressed some glaring feature omissions in the iPhone’s operating system. Cut-copy-paste and MMS have been two of the often-discussed additions, but to me, the ability to search (using Spotlight) is perhaps the most-important hole that’s been filled. Prior to the release of iPhone OS 3.0, you simply couldn’t search on the iPhone. If you wanted to find something in your calendar, contacts, or e-mail, you needed to do so on your Mac. Now, with one somewhat-major exception, you can run those searches on your iPhone instead. Spotlight on the iPhone can search for matches in your calendar, contacts, notes, e-mail, and even in the textual data associated with music, podcasts, video, and audiobooks. Even better, Spotlight can also find applications on your iPhone. After a couple years of not even thinking to try a search on my iPhone (excluding contacts in iPhone OS 2.x), this newfound ability to search—something taken for granted in most every other smart phone ever released—is most welcomed. 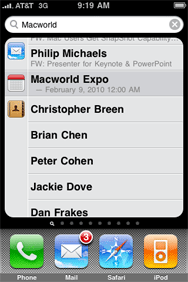 Even compared to searching contacts in the prior version of the iPhone OS, Spotlight is much simpler, as I don’t have to find then launch the Contacts app. Once on the search screen, just tap out whatever it is you’re looking for, and the iPhone will display matches as you type, just like on the Mac. 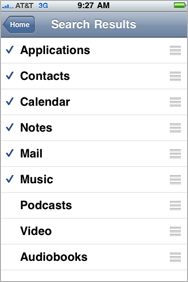 The matches are grouped by category, with icons for Mail, Contacts, Calendar, etc. appearing to the left of each section. Tap on any entry in the list and you’ll be taken to that item in its source application. Though I’ve only been using it a short while, I’m definitely hooked on search—it makes all those important bits of info stored in my iPhone actually usable, because now I can find them. Most of the time, at least. Spotlight on the iPhone isn’t quite as all-powerful as is its Mac-based relative. While it searches many data stores on the iPhone, it doesn’t necessarily search everything in those data stores. Notes stored in Calendar entries, for instance, aren’t searched. That, however, is a minor limitation compared with the fact that the text of Mail messages aren’t searchable—only the To, From, and Subject fields. I can guess at the rationale here—creating an index of the contents of all messages would take some time and could be sizable. However, not being able to search on the content of a message means that I either need to remember who sent it to me, or what they used for a subject line. Many times, those things are fresh in my mind, but not always. It’d be nice if there were at least an option to index the text of all e-mail messages, along with a warning about the size of the resulting database. While data searching is useful, it’s Spotlight’s ability to launch apps that I’ve been using most often—at least since my colleague Dan Frakes pointed it out to me! Sadly, iPhone OS 3.0 doesn’t offer any improved organization options for our apps; you still can’t group similar apps in a folder. Things are actually somewhat worse, as the iPhone now allows eleven pages of apps, up from nine in the prior release—that’s up to 32 additional apps to dig through to find the one you want to run! So instead of paging through all your apps, flick (or tap) over to the Spotlight screen from the home page, and then tap out some portion of the name of the app you want to launch. You don’t even need to use the first part of the name; any segment will do. As an example, I use FlightTrack for tracking airline flights on the iPhone. But I have a few other apps that begin with Flight, so I launch FlightTrack by tapping trac, and FlightTrack appears at the top of the list. Most times, you’ll only have to tap out three or four characters of a program’s name, and you’ll then see it on the list of matches. To make this feature even more useful, I rearranged the order in which Spotlight’s matches are displayed. You do this by opening the Settings application, then tapping General -> Home -> Search Results. Drag each item by the bar icon on the right to rearrange its position in the results. By default, the iPhone will list matches from contacts first, followed by applications. Because I’m using Spotlight mainly as an application launcher, I dragged Applications to the top of the list, followed by Contacts, Calendars, Notes, Mail, and finally Music. I disabled the other results categories (by removing their checkmarks), because I don’t do much with those items on my iPhone. Now when I search for an app, I know it’ll be the top item in the list, making it super-easy to launch. My fingers are loving Spotlight—no more multi-page flicking about as I go rooting around for an application. Instead, a couple of button taps, a couple of keyboard taps, and my app of choice is right there, ready to launch. For now, Spotlight’s power is reserved for Apple, as there’s no Spotlight API for third parties to use to put search in their apps, too. Given such an API exists on the Mac, however, I would think we’ll see this on the iPhone, too, and probably sooner rather than later. Overall, I’m thrilled with Spotlight on the iPhone—with the sole exception of the lack of an index for the content of Mail messages. I’m not sure if it’s feasible, but it’s something that would make this near-perfect addition to the iPhone OS even better.